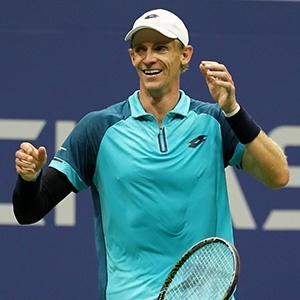 New York - Kevin Anderson stands out at 6ft 8ins (2.02m) as the South African readies to tackle Rafael Nadal in Sunday's US Open final. Tall in stature, the 31-year-old has also had to develop a thick skin. Born in Johannesburg, but a long-time resident of the United States, Anderson is his country's leading tennis player by a country mile. After a successful college stint in the United States at the University of Illinois, Anderson's professional career had been one of peaks and troughs. But having reached his first Grand Slam final at the age of 31 and at the 32nd attmept, he is the blueprint for perseverance. Hip problems saw his world ranking slump in January this year to 80, its lowest in seven years. He has also shrugged off leg and elbow injuries in 2017. In 2016, his medical complaints stretched to ankle surgery, groin, left knee and right shoulder problems. On Sunday, he will be the first South African in the US championship match since Cliff Drysdale lost to Manuel Santana in 1965. He is also the first from his country into a Grand Slam final since Kevin Curren made the 1984 Australian Open final. Should he overcome Nadal, he'd be the South African champion at a Slam since Johan Kriek at the 1981 Australian Open. Anderson has three titles -- on home ground at Johannesburg in 2011, Delray Beach in 2012 and Winston-Salem two years ago. But it has not been an easy road for a man who has faced death threats as well as being labeled a traitor for his less-than enthusiastic commitment to the Davis Cup. "It pretty much happens after every match regardless of the circumstances," said Anderson after a first round loss at Wimbledon in 2015 had many on social media baying for his blood. "People who have bet on the match tend to take to social media and say very inappropriate things." He has attracted criticism at home for not playing Davis Cup since 2011, having featured in just five ties. But with the South African number two Lloyd Harris languishing at 231 in the world rankings, Anderson insists he has a key role to play in inspiring youngsters at home to take up tennis. "I try and focus on the youth coming up and I think tennis is a great sport regardless of how far you make it, just obviously a lot of good life lessons," he said. It's an ambitious goal in a country whose sporting obsessions are rugby, football and cricket and where individual success has come courtesy of its golfers. Off the court, Anderson is married to college sweetheart Kelsey and counts the likes of South Africa cricket superstar AB de Villiers amongst his friends. He is also an influential member of the ATP Players Council.